I was doing some exploring and found this on the second floor of the Samson building downtown (the one under construction following the Qulaar invasion). It is embedded in the floor next to a cement mixer. The writing looks Celtic or Tolken/Middle Earth-like. not sure what their intent is, but they are norse runes. from the top its ansuz, mannaz, fehu, ehwaz, perth and ansuz again. Just checked after the Bloodmoon event - it's still there. So it probably isn't connected to that. 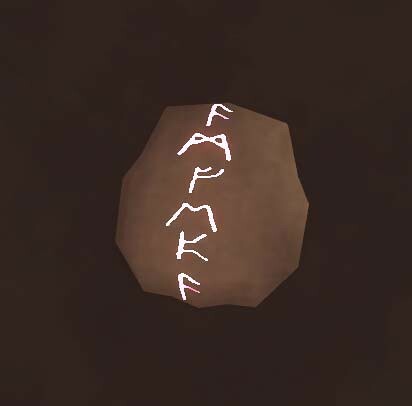 It's the top of a skull marked with runes, and is a Mysticism Node. Whoever you are, be that person one hundred percent. Don't compromise on your identity. Yeah, I'm legit surprised that this thread got to 7 posts without someone mentioning the blindingly obvious(to me anyways). So it is simply a crafting node that is sunk too low in the concrete? LOL! And here I thought it would be something really mysterious. HA! Several of the crafting nodes were designed with features that could show based on the elevation of the node compared to the surface they are placed on. This can radically change their look at times, based on how much is visible, and how much is "submerged". It's also the words Fae Map. See "what is this?" expected a Barry Burton thread. Disappointed. They all thought I was out of the game....But I'm holding all the lockboxes now..